After a long development period of nine years, which saw many followers assuming the game would never release, we were finally graced with The Last Guardian at the end of 2016. General response was quite favorable overall, and the game has become quite loved, garnering reasonable critical response even here at GameSkinny. 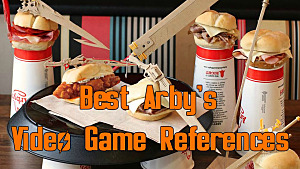 You might, however, be astute enough to notice my take on the game in the review’s comments… and unfortunately, despite my best efforts, I could not bring myself to love the game as so many others did. A little over a month after sinking my teeth into it, I feel it’s time to come forward and deliver a second opinion. 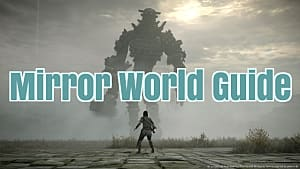 I’m hardly the first to point out the negative features of the game, but I feel there are a couple of big arguments that simply must be made both for those who have yet to play The Last Guardian and for any future games that try to emulate it. First, let’s strip back The Last Guardian for what it is at its core: an exploration and physics-based puzzle game, which has the gimmick of controlling two characters at once. When you describe it like that, the concept seems fairly bare bones. Obviously, there is more to it than that, but the kind of game at the core of this title is not particularly unique. There are other puzzle games out there that utilize exploration and physics, but almost all of them are somewhat niche titles. Barring a few exceptions like Portal, it’s rare that this genre garners large sales figures and general critical response like The Last Guardian has. It may seem obvious that it’s clearly a puzzle game when you look at it closely, but somehow this was not something that came to mind when I first picked it up. I honestly didn’t know what kind of game I was getting into. What I did know was that whatever it was, I was going to travel alongside and experience the virtual life of Trico throughout it. The genre and general style of the game didn’t really occur to me, and it didn’t factor in how I was processing it at first. The developers did a reasonable job in obscuring what is a very niche style of game with a more mainstream sense of appeal. They are taking something that wouldn’t necessarily appeal to many gamers and have effectively blanketed the core gameplay with an interesting concept and aesthetic to intrigue people into playing it. It’s benign misdirection, mind -- not the kind of harmful or potentially malicious lie that a developer might make in order to sell you a game that is missing promised features. 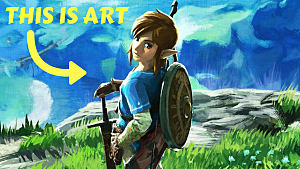 It’s simply that they have crafted an experience that can supersede what the game truly is. The problem with creating this situation is that for The Last Guardian to succeed, it absolutely had to sell you this misdirection. It couldn’t afford to lead you halfway. You needed to believe it and be swept up by it wholly and completely. If you didn’t, that’s when the cracks in the formula start to show. And in the end, despite a valiant attempt at doing so, the cracks shone through enough that I started to see through the veneer and into the core game underneath. From the very start of the game, the Boy is placed in a room with a bound Trico, and with only a few very gentle (yet strangely constantly recurring) tutorials, the game sets you off on this adventure. 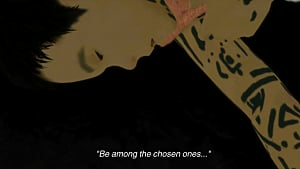 This is arguably the most crucial point in the game because it is what pulls you into the experience that will hopefully stay with you until the end. The immersion needs to be built here, and generally, I think the opening segments do a reasonable job of this. Players who ultimately end up disfavoring the game seem to rarely come to that conclusion this early. Despite the controls feeling out of date and unresponsive at first, the opening segment provides enough engagement for players to get a sense of how to work with them and further engage in the immersion of it all. They continue to be irritating at times, but unlike many of the primary complaints about The Last Guardian, this wasn’t the deal breaker for me… not completely, anyway. Most importantly, you start to get a sense for Trico. You figure out how it moves, how far it can go, what motivates it and how it will react to certain things. Can it swim? Will it swim? What kind of ledges and jumps can it make? Can you hold on while it does so? This is the kind of question you will ask yourself, and every question starts to drag you further into the game. Before long, I found myself immersed. 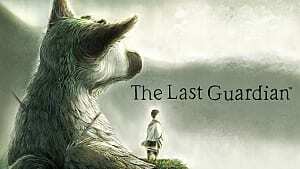 The Last Guardian stopped being a game that I’d purchased and became an experience, one that I was fully focused on. The “lie” had been successfully sold -- now it was paramount that the immersion was maintained. To its credit, the game really did try. 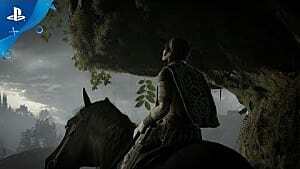 With the stirring orchestral soundtrack, fantastic sound design, gorgeous scenery and a tremendous sense of scale to the stone ruins you’re climbing through, it’s a game you really want to like. 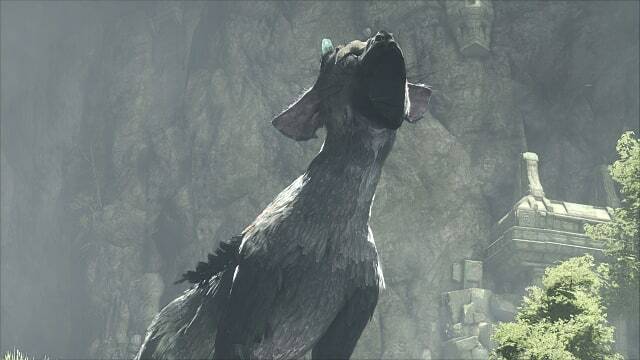 The way that Trico moves, feels and reacts to things only furthers this, which I’ll further touch on momentarily. The Last Guardian needed to immerse you so much that you completely forgot the nature of the core game. In the end, however, the facade simply wasn’t able to hold. The sheer magnitude of the immersion required to keep players satisfied with the game and keep oneself in the heart of the experience was always going to be a challenge to maintain, and for some players, it just didn’t seem doable. As long as the misdirection applied, the immersion would hold. Unfortunately, there are enough problems that become apparent if you look at them too long or they occur too frequently. The oft-maligned controls and terrible camera are the most commonly cited, but they’re not the only ones. There were multiple times where I stumbled upon the solution to a puzzle, only for the game to not register it. This was usually because Trico didn’t want to respond, and admittedly, Trico sometimes has a mind of its own for how to proceed. That stops being charming when you stumble upon the actual solution, but Trico breaks and simply chooses not to execute what’s necessary. It wasn’t a case of having a mind of its own. Finding the solution to a puzzle but then the solution not working is a problem. It encourages players to move away and start looking for other answers to a puzzle that’s already solved. It’s only when after a few minutes of messing around for alternatives that you inevitably get back to the correct solution, and this time Trico decides to cooperate. At this point, it’s not a charming personality quirk - it’s a broken puzzle and a frustrating experience for the player. Other times, the physics choose not to work appropriately. Things that are supposed to drop or be thrown in certain directions can get completely stuck and force you to restart, instantly breaking the immersion. Throwing barrels is what most people would think of, but there are times when I’ve gotten chains stuck on ledges that won’t drop down to let me climb them. 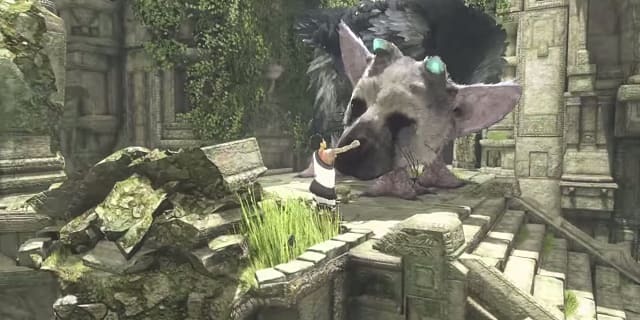 What if Trico’s tail needs to be climbed but gets wedged in a gap and won’t drop to you? Or when a cage that I’m within and need to roll becomes lodged on a rock and will no longer budge? More cracks in the glass. Personally, the entire mechanic of running from the stone soldiers felt needlessly frustrating. 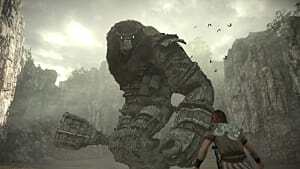 They weren’t especially fast compared to you, but they were difficult to avoid, often had to be negotiated in tight corners that didn’t allow much room to work with, and could only be removed completely by Trico. In theory, you can roll into them to cause them to stumble, but quite often they will simply be unaffected by this or recover faster than you do, and now you’re in their clutches. Once there, what do you do in order to escape? You button mash repeatedly to struggle against it for just long enough to be irksome. Meanwhile, it carries you further away from your goal, right until it drops you… and the next one in sequence is right there to pick you up again. The amount of times where I just got sick of the endless chain of grabs and futile running in circles needed to evade these guards was considerable. More often than not, I got so frustrated with these segments that I just wanted to put the controller down and stop. That’s another break in the immersion that could potentially have been designed or handled better. Performance issues are often a minor problem for me, and one that I’m willing to overlook in favour of gameplay. However, there are times when The Last Guardian’s frame rate will plummet to single digit numbers, and when this is happening in an intense action sequence it becomes extremely jarring and frustrating. It’s hard to appreciate a chase through a collapsing ruin over a sheer drop when it’s presented as a slideshow. Each of these problems becomes a small crack in the beautiful but fragile stained glass window that is The Last Guardian. A few tiny cracks might not ruin the picture, but there are a lot of them, and they occur regularly enough that it’s hard not to notice them. If the image in the window isn’t compelling enough to hide how damaged and broken the glass actually is, can it really be considered true artwork? I’d be remiss if I spoke at length about The Last Guardian without speaking of Trico. Thankfully, this majestic creature is definitely worth speaking about. 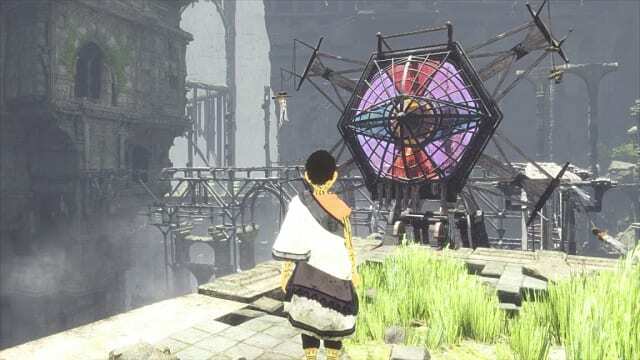 The delays in the game’s troubled development cycle feel like they have gone almost entirely towards two things: the physics responsible for much of the movement and environmental puzzles, and the AI that controls Trico. 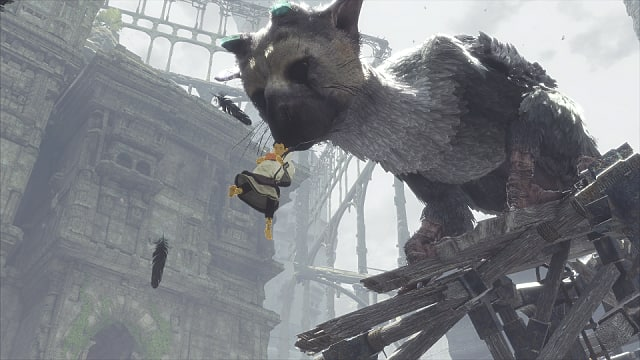 That said, this focus shines through tremendously, because the game’s biggest positive point is just how believable Trico really is. It feels almost impossible to NOT bond with this creature. It’s expressive in its actions, movements, and sounds it makes. 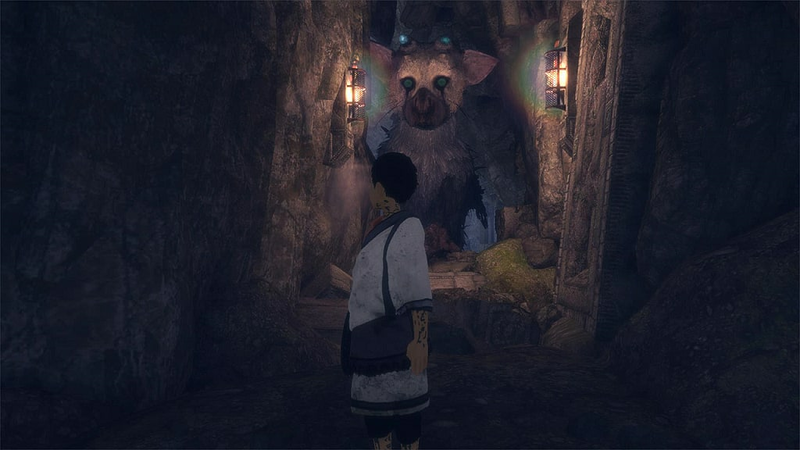 Trico is a creature with its own aims and desires, but staying with the Boy quite apparently becomes its primary one before long, and it’s endearing to watch it do its utmost to follow you. It’ll try to get through tight squeezes, jump across massive chasms, and fight off hordes of guards in order to stay with you. There are times where I had to part with it ever so briefly in order to open the way, and it legitimately felt hard to do. 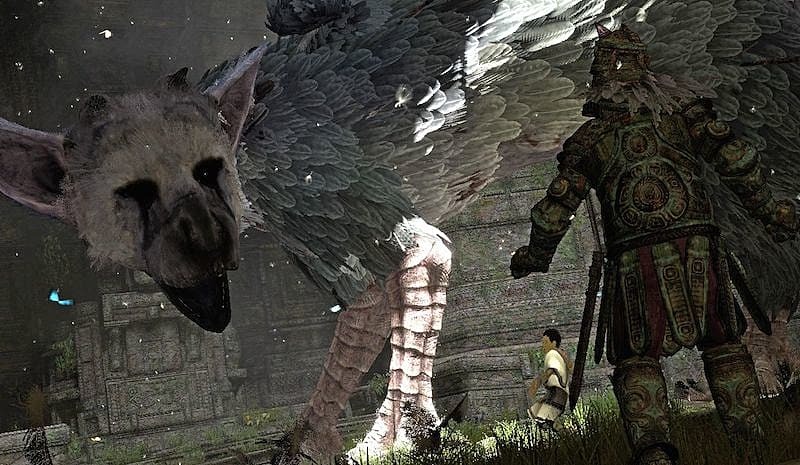 At some point, it ceases being a program to the player, and starts being… well, Trico. 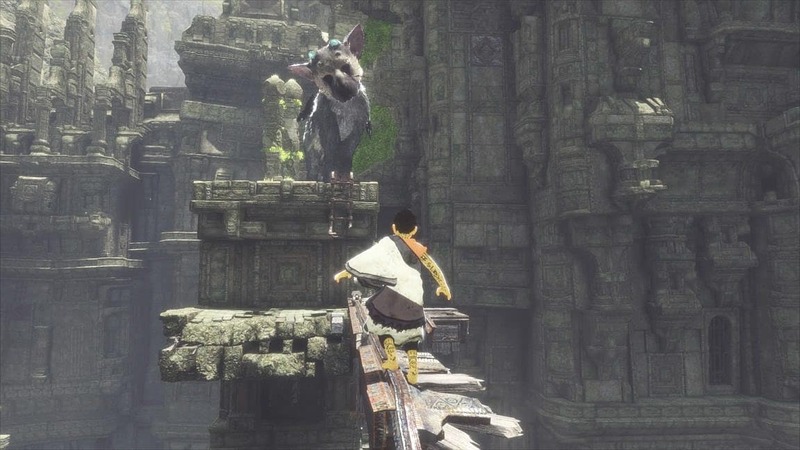 As the primary feature of the game from both a narrative and mechanical standpoint, nothing else factors more on maintaining the immersion of The Last Guardian than Trico. 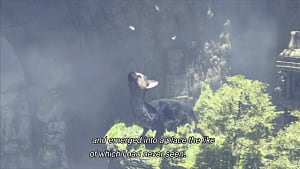 If Trico didn’t work, then the game simply wouldn’t have worked at all, and it’s truly a tremendous achievement in game design that this creature feels so convincing and alive. This is, unfortunately, a double-edged sword. 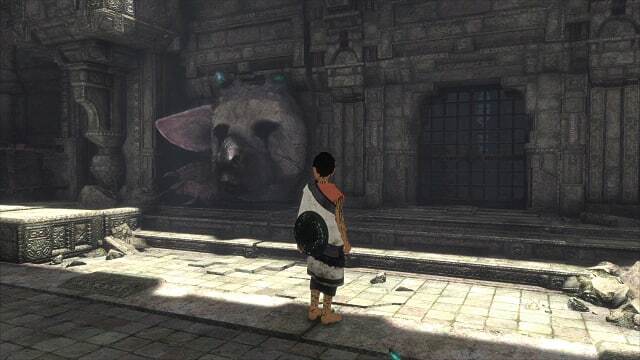 Since Trico working is so tantamount to the immersion being maintained, any time when it doesn’t becomes utterly devastating to the player’s suspension of disbelief. Nothing pulls the veil back faster than when something within the creature breaks. I’ve seen many come to the defence of this point and say that ordering Trico to do something that it simply doesn’t want to do will naturally not work. Since the creature will spot its own pathways and figure out points of interest that are often guides for the player to investigate, trying to brute force what you think is a solution will see it ignore you. That’s not the problem, though. 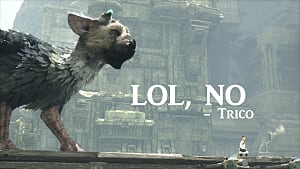 The problem is thus: there are legitimate times that Trico’s AI simply breaks or doesn’t respond, and it immediately pulls you from the game. 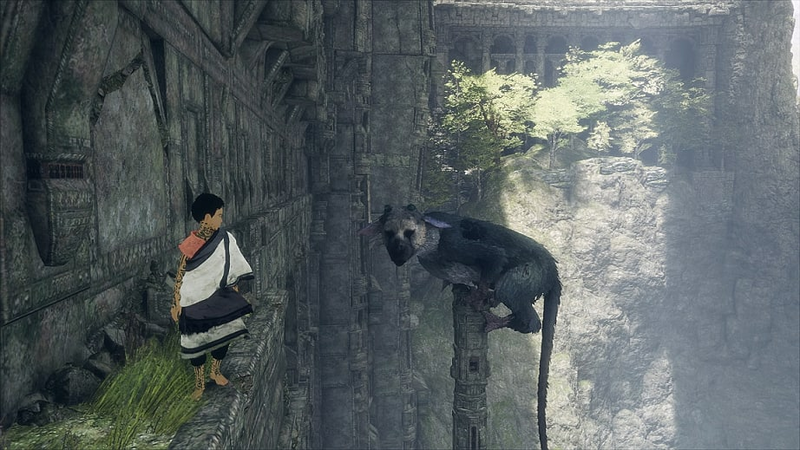 I outlined an example above where despite being the only way to proceed, Trico chose not to jump up a ledge even though it was looking towards it. 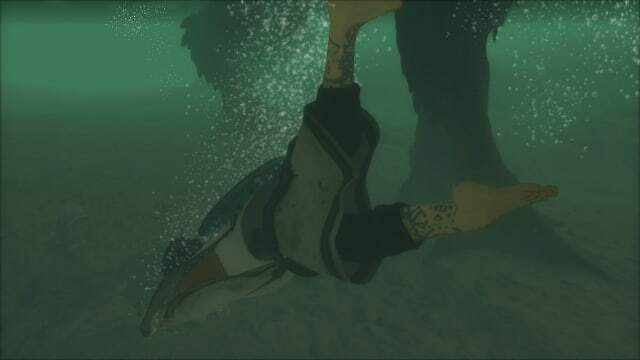 Giving up and assuming an alternative solution proved ineffective, yet next time I went to that same spot, Trico worked. This happened on multiple occasions, and it was frustrating to feel like my time had been wasted in an attempt to solve a puzzle that I’d already bested. Other times, comparatively scripted events won’t work, and Trico won’t respond as seems necessary. It seems especially tentative about striking with its claw at your command, and there were multiple times where it just didn’t. Once, it decided to completely ignore the enemies carrying me off and let me run around in circles without responding until I reset, where it worked just fine. 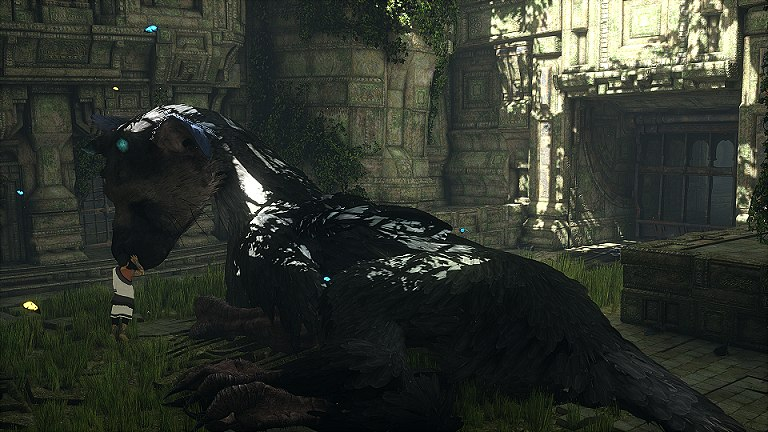 Again, the technical efforts behind Trico are not to be understated -- they’ve done an amazing job with the creature, and the game is worth watching or experiencing somehow just for that sensation of bonding with a virtual animal. But, like the entirety of The Last Guardian, it needed to work with as few breaks as possible to maintain the immersion, and in the end Trico couldn’t do so. While it might quickly succeed in applying the misdirection and immersing players early on, it’s so crucial that the immersion is maintained to disguise what the game truly is. It was a monumental undertaking to try and get there, but ultimately it just couldn’t quite achieve it consistently. At the end of the day, it feels like whether you liked The Last Guardian or not is largely up to what ended first: the game, or the player’s patience. Those with high tolerance for frustration and the patience to persist through all of this ended up enjoying the game. Players who lacked that tolerance like myself seem to be less common (or at least less vocal), but I’m certainly not alone in this. 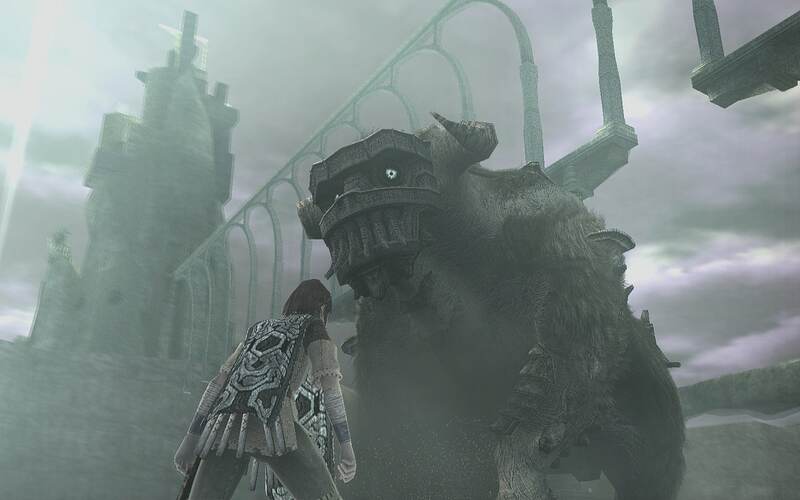 It’s also a common argument that those who liked Shadow of the Colossus will like this game, but I believe this to be pointedly untrue, and as someone who thoroughly enjoys SotC then this article should serve to dispel that belief. I could write almost an entire article on this point alone, however, so for now all I can say is that I consider that notion fervently untrue. 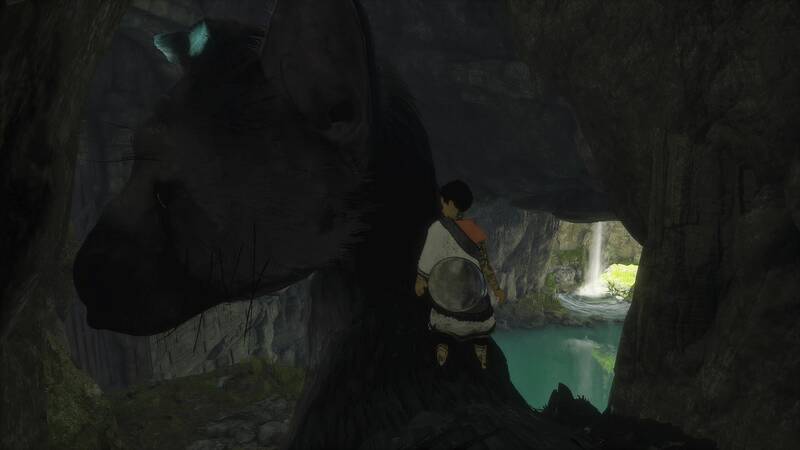 Many cite that the experience of playing The Last Guardian is worth all this, and I’d almost hesitantly agree… yet instead, I almost think that it’s better to watch a playthrough of the game than to play it for yourself. Doing so allows you to bypass many of the frustrations you might experience and hold on to the suspension of disbelief longer. There’s a fantastic piece of artwork made out of stained glass to be had here. Unfortunately, it is fragile, damaged, and relies perhaps overly much on player perception of the glass to properly reveal itself. You might look at it and see the art in the window… but in the end, despite waiting for the game for nine years and trying my hardest to enjoy and perceive it as it was… all I can see are the cracks in the glass. Since my opinion on the game doesn’t seem to match the outspoken norm, what did you think of The Last Guardian? Did you enjoy it, or do you share my thoughts? Whatever your stance, I’d love to hear your comments on it.